Science has long marveled at the exceptional properties in water. Just like modern scientists we haven’t unlocked the mysteries of water. However, we have learned the artistic value of water in aesthetic design. This is especially the case in pool design where water features can evoke a wide variety of emotions. 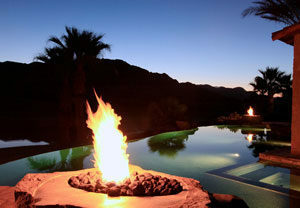 Azure Pools & Spas is the premier pool contractor in Rancho Mirage and southern California. Our designs and passion for pool construction has captivated clients from all over the world. Our team has over 25 years of new pool design and pool remodeling experience. We would love to work with you on your next pool project! Some contractors confuse customizing with copying. 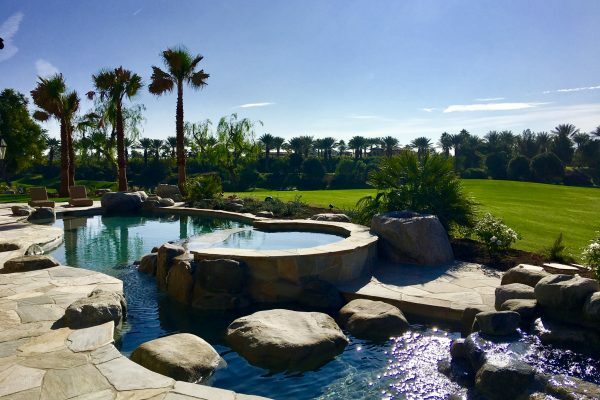 They show you a bunch of things they can do then allow you to match a limited number of options together for your pool’s construction or remodel. We don’t work that way. Azure Pools & Spas truly puts the power of customization in your hands. The only constraints are the physical parameters of the property, your desires, and our imagination. We have a strict code to remain open to design so long as they involve safe construction methods. Our portfolio prove this. We are ever challenging ourselves with building strategies and designs that incorporate techniques and art from all over the world. Our aim with every project to bring your vision to life. Designing an eye-catching yet functional pool takes experience, planning, and time. The Azure process begins with the gathering necessary approvals from homeowner associations and Rancho Mirage city authorities. Afterwards, we’ll begin laying out the grounds and excavating it. Our team will make sure that all of the measurements and features of the project are matched with approvals and permits. Lastly, we’ll begin the construction process from the pools foundation upward.